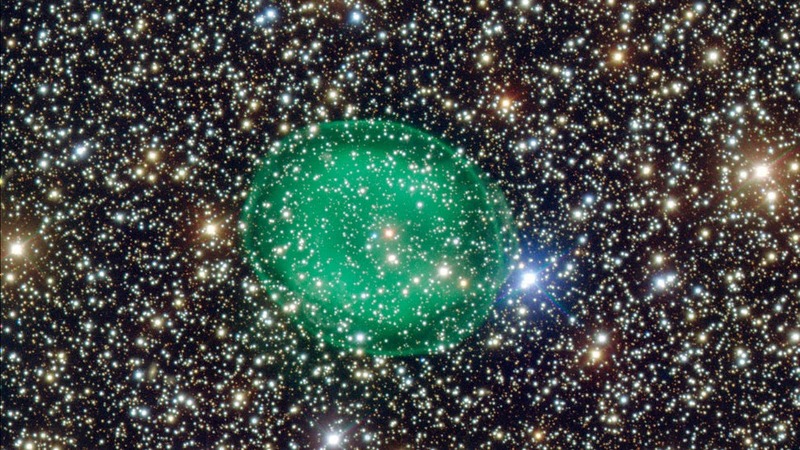 Can this be a cosmic-scale amoeba like the one come across by the Enterprise crew in “Immunity Syndrome?” More possibly, it’s the planetary nebula IC 1295, a shining green bubble made from gas that’s being driven out by a fading star. Nebula IC 1295 is situated 3,300 light-years away and it located in the constellation of Scutum. The planetary nebula seems like a giant, shining gaseous bubble, and it backgrounds a faint and vanishing star that’s transitioning into a white dwarf. The old star is blowing its atmosphere into space, the outcome of unbalanced fusion reactions. The externally arising gas is covered in strong, ultraviolet radiation from the star, which is what makes it glimmering. The green shadow comes from ionized oxygen. All stars that are approximately the size of our own will go through this procedure; the bubble-effect will last for thousands of years. The perky blue-white spot at the heart of the nebula is the burnt-out leftover of the star’s core.